I love designing 2-page layouts With You in Mind so you can sit, relax and have the designing done for you. Instead of spending hours trying to design your own layouts, why not let Maine Country Charm create pages for your memories? Try one of our 12x12 precut page kits and in no time you will be ready to look and see what other topics or seasons we will have to offer to complete your scrapbook projects. Depending on the chosen kit, you may need some extra basic scrapbooking tools, i.e. a hole punch, a pair of scissors or a fingernail file. For all projects you will need to select your favorite adhesive and adhesive type, whether it be a tape runner, glue dots, glue pen or choose from many other available products. Color photos are included with each kit, along with some basic instructions. Special 'cuts' to the layout will be all done for you. Each of our kits contain precut photo mats, elements and suggested layouts, but we encourage you to get creative and feel free to come up with your own layouts. Please note we like to chalk and/or ink our edges. Chalks and inks won't be included in the kits but contact us and we can add them to your order. 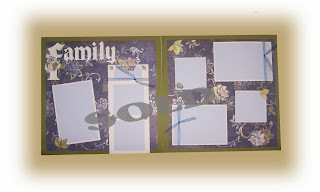 This Family/Heritage Kit is done with enough mattes to accommodate up to 7 pictures with a 'hidden' tag to journal on or place another picture. Please notice the insert picture to see how the tag pulls out from the top of the element. Everything is cut and ready to put together. This is a great additon to your family or heritage album.